and Army Air Corps jointly launched the 'Explorer II' stratosphere balloon, which attained an altitude of 72,395 feet above sea level (a world record), as well as gained valuable scientific data. The flight was commanded by Captain Albert W. Stevens (U.S. Army) and piloted by Captain Orvil A. Anderson (U.S. Army). The gas bag, constructed by the Goodyear-Zeppelin Company and made from long-staple cotton fabric which had been rubberized, used in the flight has a volume of over 3,700,000 cubic feet, contained over 2 and a half acres of fabric, and weighed over 15,000 pounds! 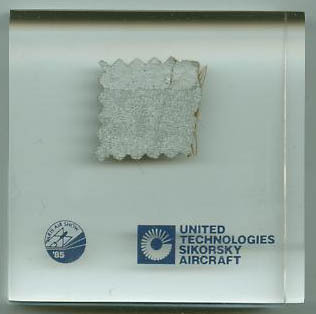 The flight lasted just over 8 hours during which the flight crew addressed a global audience by shortwave radio, took photographs, and collected data on cosmic rays, high-altitude spores, and other subjects. Sixty-four scientific instruments filled Explorer’s metal gondola. In contrast, the explorers seemed strikingly low-tech: They had borrowed football helmets from a high school and packed sandwiches. Each is a piece of rubberized fabric, 7 inches (17.8 centimeters) long and 2.25 inches (5.7 centimeters) wide. The front bears a photograph of the balloon, and flight information appears on the back. W4050, the Prototype de Havilland Mosquito is the last remaining WWII Prototype aircraft. This aircraft is now located at its birthplace, Salisabury Hall, London Colney. Hertfordshire. Piece of Tire Removed During Restoration of Boeing B-17F S/N 41-24485, "Memphis Belle"
The "Belle" was the most famous because she was the first heavy bomber flying against Hitler in the European war theatre to complete 25 combat missions and keep her entire crew alive. She flew for 10 months from November 7, 1942 to May 17, 1943. The Allied commanding officers in had set 25 missions as an incentive for air crews to go home. Morale was extremely low because 80% of the bombers were shot down during the first three months of America's combat flights over Europe. The Belle's crew shot down 8 German fighters, probably destroyed five others, and damaged at least a dozen more. She dropped more than 60 tons of bombs over Germany, France and Belgium. During her 25 missions, she flew nearly 150 hours, and covered more than 20,000 combat miles. The Memphis Belle has been in Memphis, TN, since July of 1946 when she was saved from the surplus scrap operation in Altus, OK, by the City of Memphis. She is designated a national historic treasure and will never fly again. 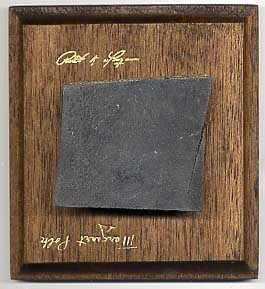 A section of tire used on the Memphis Belle is mounted on a wooden plaque about 4 inches square. 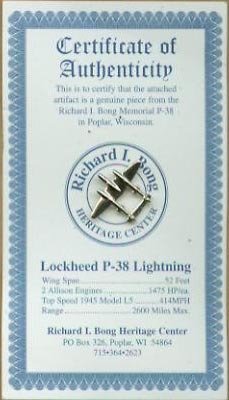 Signatures of the pilot, Bob Morgan, and the 'original' belle, Margaret Polk, are printed in gold on the plaque. However, on this particular plaque, one of the signatures is inverted. 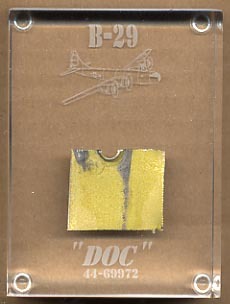 This item was made available through the Memphis Belle Memorial Association. Recently, the Memphis Belle was moved to the United States Air Force Museum at Wright-Patterson AFB near Dayton, Ohio. Manufactured by Boeing Aircraft at Wichita, Kansas and delivered to the United States Army Air Force in March 1945, the B-29 Superfortress, no. 44-69972 was sent to Birmingham, AL, for its first major wartime modification. In May 1945, it was assigned to the 3rd Air Force for active service. Afterwards, over a year later, it was placed in storage at Peyote Army Air Force Base, TX, where numerous B-29s were stored between WWII and the Korean Conflict. It was then modified for radar calibration and flew numerous radar defense evaluation flights on the Eastern Seaboard from July of 1951, until February of 1955. Later, the 17th Tow Target Squadron received the B-29 and converted it to a "Tow Target" aircraft for the Air Defense Command at Yuma County Air Force Base, AZ. Its final task with the Air Force was flying to the United States Naval Weapons Center, China Lake Naval Air Station, Ridgecrest, California, on March 14,1956, for use as a ballistic missile target for air combat training. Over the years, volunteers from the Duluth Air Force Base and, later, the 148th Fighter Group of the Minnesota Air National Guard coordinated repairs and maintenance to ensure the safety of the mounting structure and aircraft. In the fall of 1994, they discovered that the aircraft had sustained considerable damage, including corrosion and cracking, from the effects of Wisconsin's harsh winters and sunny summers. To save the valuable fighter plane, members of the Minnesota Air National Guard removed it from its mountings and moved it to their headquarters in Duluth. For three years the Minnesota Air Guard provided working space where both civilian and Air Guardsmen could volunteer time to restore the plane. They dedicated over sixteen thousand hours, using weekends, holidays and evenings to restore the P- 38 to non-flying museum standards. Six volunteers together donated over fourteen thousand hours.